See an eternal blue flame like no other on this overnight trekking tour on Java, the island next to Bali. You will hike up Mt. Ijen to see the magnificent 'blue fire' in Ijen Crater, the only place in Southeast Asia and one of only two places in the world where you can see this natural phenomenon. As it's only seen at night, you'll leave Bali in the afternoon and return the following afternoon, traveling to and from Java by ferry. Breakfast and lunch are included. Your tour begins in the late afternoon with pickup at your Bali accommodation for the drive to Gilimanuk Harbor in western Bali. When you arrive, board the ferry to cross the sea to Banyuwangi, East Java. The ferry ride is 30 minutes. Upon arrival at the Banyuwangi harbor around midnight, go directly to the starting point of your Mt. Ijen trekking adventure, about one hour away (if you arrive in Banyuwangi Harbor early the driver will take you to the Rest area to wait until the time of Trekking ticket desk is open), From here, receive a tour briefing and your safety equipment, including a flashlight and gas mask, and then begin trekking to the top of the mountain at 1:45am. Your trek takes between one and two hours to reach the summit along a 1.8-mile (3-km) route that is divided into three parts: 800 meters slightly uphill, 1 km uphill, and then 1.2 km flat. During your trek, you'll encounter some of the world's strongest men—sulphur miners who carry the sulphur, which weighs 132 to 176 pounds (60 to 80 kg), on their shoulders with bamboo sticks. Upon arrival at the summit around 3:30am, as long as the weather is clear, you can see the 'blue fire' of the Mt. Ijen crater and also spot the Milky Way. Follow your guide for the best photos of the blue fire, depending on the weather conditions and wind direction, as your safety is paramount. From the viewing points, you can also see the mining activity using the traditional technique of iron sticks, with no safety tools for the miner. Before you head back down, enjoy a light breakfast on top of Mt. Ijen around 6am, or you can eat when you arrive at the parking lot, if you prefer; just tell your guide before trekking. 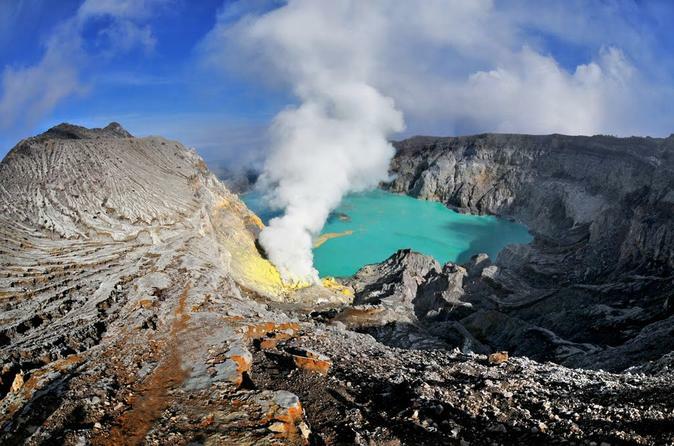 You will also have the chance to see the largest acid lake on Java. It takes about an hour to get back down to the bottom, where you'll be transferred from the parking lot to the Banyuwangi harbor. Around 10am, you'll be back on the ferry to return to Bali, arriving around 11am. Lunch is provided around noon at a local restaurant , After Finish Lunch the Journey Continuoe to Visit Bunut Bolong Tree is a hug banyan tree with big hole. The Bunut Bolong tree is unique, because you can drive with a large car through the tree , after that visit Rambut Siwi Temple It sits on a cliff with stunning views over rice fields and the coastal area. There are also two caves that overlook the sea. and Quick stop in one of Rice field view on the way back to your hotel, where you'll be dropped off around 4pm or 5pm to end your adventure.